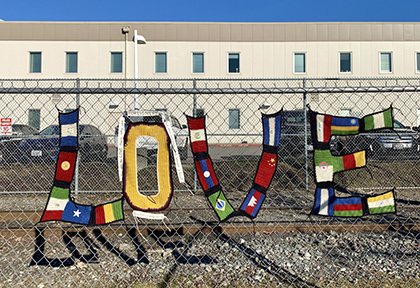 A largely all-volunteer organization, we visit detainees inside the Northwest Detention Center, greet them as they are released, then help them to reach their loved ones all over the country. Originally called the NWDC Roundtable, the organization held its first meeting in November 2005. Our broadly diverse participants included concerned individuals and representatives of advocacy groups, social service agencies, churches and other faith-based organizations, Congressional liaisons, and officials from Immigration and Custom Enforcement and The GEO Group Inc, a private firm that owns and operates the NWDC. The goal of the Roundtable’s attendees was – and still is – to use their collective knowledge and experience to provide the most effective practical help to detained immigrants and their families, and to increase awareness about the NWDC, which became one of the largest in the nation in 2009 with 1,575 beds. To create an inclusive and welcoming community to affirm the humanity and dignity of immigrants and provide them with access to vital resources. We provide emotional support to immigrants in detention and, when they are released, we warmly welcome them and provide transitional support. We connect released immigrants to vital resources so they know they are valued and safe, and are on the path to live independent and productive lives. Our Phone Access and Volunteer Visitation end the isolation of detained immigrants. Our Welcome Center and Post-Detention Accompaniment Network (PDAN) volunteers offer safe release services and support. Our Hospitality House offers safe and welcoming temporary housing to those who need it. Many people are unaware of the Northwest Detention Center on the Tacoma Tideflats. With 1,575 beds, it is the nation’s fourth largest. We offer educational programs on detention issues and give presentations to churches, schools and universities, civic groups and community organizations. Monday was a pretty light night. We greeted one man from Cameroon who was granted asylum and was picked up by his brother. Two Indian gentlemen were taxied off to the Sikh Temple. Then we met one man from Pakistan and one from El Salvador, both needed to go to the airport, both out on bond. The journey to the US was a horrible ordeal for married couple, D from Ukraine and M from Russia. Once they finally arrived in this country and claimed asylum they were separated. He was sent to the Detention Center here and she to San Diego. He was not told where his pregnant wife had been taken. “Here in Tacoma you get released and there are volunteers waiting to help you. In California you are released to the nearest train station and they didn’t care if you have money or a ticket”. At 3:45 two men were released, one from Kyrgyzstan who had won asylum after being held for 6 months. When we took his information we noticed how much he had changed from his ID photo and he told us that he had lost 21 kilos (46 lbs ) during his stay because the food was terrible. He spoke very little English but we were able to patch together his flight arrangements with his sister in Philadelphia, recruiting an English speaking neighbor to help clarify the plan. The other man was from India but had been residing in Mississippi for the past several years, where he was the owner of two gas stations. He had come out to Washington to attend a family wedding. He was held for 4 days and then released as he had been held by “mistake.” As he waited for a friend to pick him up, we talked about AID NW and as he thanked us and left, he handed us a $100 bill. Last Friday at the Welcome RV was certainly a joyful one! Two women from Guatemala, and three men, one from India and two from Guatemala, were released. All gladly received backpacks, toiletries, and snacks. Four of the five also accepted new clothing. The two women, both young ladies, looked so pleased to pick out fresh clothes – including trendy shoes, jeans, and fashionable tops – and gave no backward glance as they threw away their old clothes. One of these young women was only 19. She had been at the detention center for three months and held in a federal prison before that. Her next stop was to meet family in Florida. She remarked to S that this airplane trip would be noticeably different from her last one, when she had handcuffs on her ankles and wrists. Yesterday at the Detention Center, nine were released, with seven visiting the Welcome Center. A woman from Cuba was released at 11am and was waiting at the RV. A daughter in Houston provided a plane ticket, and she was taken to the bus for a ride to the airport. She was going to see a two year old grandchild that she had never met. A woman from Honduras was released after spending 3 months in the Federal detention center at Seatac and a week at the NWDC. She needed to get to her aunt’s in Orange County, CA. After a lot of phone calls and texts, her aunt was able to pay for her ticket to CA. She spent the night at the Hospitality House and will get a ride to the bus station in the morning. I was a little worried as she doesn’t speak any English and has never flown before. The ride from NWDC to the Hospitality House was her first sight of the US. She was quite awed by downtown Tacoma. She said that she left Honduras with her brother because it was very dangerous. Her uncle was killed. Both she and her brother were detained by ICE at the Texas border. His bond was $1,500. hers was $12,000. He was held for a week, she for over 3 months. Another great crew witnessed amazing things last night. J visited with a gentleman who was sitting in his car. He had driven all the way from California to pay his cousin’s bond because it was to be set at $25,000 but if he came and vouched for the relative, the lawyer felt that the bond could be reduced. He paid $17,000. He came into the RV, and helped us translate for the 7 Sikh people who eventually came out! Tuesday evening began with the release of a young man who dropped to his knees a few feet after his release and with arms lifted, prayed for several minutes. Two men from Egypt and Nepal went straight to the airport A man from El Salvador had his family waiting for him. Despite a horrific history of torture, he was denied asylum and was released on $25,000.00 bond. His wife and her children were very excited to see him. A gentleman from Costa Rica has lived here 21 years and got picked up two weeks ago. He was very upset that he had never committed ANY kind of crime or misdemeanor and had to spend two weeks in detention. He has a 21 year old daughter who is a US citizen. Finally, a gentleman from Eritrea came out. He had asylum ! …We now had 2 men and a woman who needed a place to stay… Stephanie from World Relief had called to say they were set up for someone, if we needed… F and I closed up the RV and were thankful for another night of blessings. We spoke to the Haitian man’s relatives in NYC who got him a plane ticket NYC for 9PM. so J hustled him to the bus so he could make that plane. Two men from Sudan, one who had been living in the states for 23 years, were taken to Hospitality House. We gave ice-cold Cokes and backpacks to all three released, and enjoyed visiting with one young Gujurati man, locating his hometown on the map. A wife with her newborn and a friend drove from Bellingham to pick up her husband. A young male from Eritrea had no relatives in the US. He was taken to the Hospitality House. The gravity of all the decisions he need to make seemed to weigh on his elation at being out. A male from Vietnam (whose father was a GI who he had never met) was released. He was picked up by his Latino cell-mate’s wife, who was taking him to Seattle. When the car door opened, her 4-year old daughter screamed out, “Uncle Chong”. What we learned was horrifying: People are now being released on $45,000(!!!!!) and $30,000(!!!!) bond! There seem to be “visiting judges” who come in one day a week and seem to be responsible for these aggressively high figures. Total tonight: 17 released, 15 visiting the van, at least 24 family members present 1 attorney, 2 other visitors. A busy, satisfying day at the Welcome Center. Many local congregations offer us continued, vital support.